Do you know where your bottled water comes from? Sales of bottled water are on the rise, increasing 2 percent, to $7.8 billion, from August 2010 to August 2011 in supermarkets, drugstores, gas and convenience stores, and mass merchants (excluding Walmart), according to SymphonyIRI Group, a market-research company. If you're going to pay for a product you could get for free, it helps to know what you're buying, so below you'll find a water glossary. Along with the information that follows, note that you may see “glacier water” and “mountain water” on bottles, but there's no standard definition for those terms. Whatever the bottle says, don't be misled by crisp blue labels and pictures of mountains. Forty-seven percent of the bottled water sold in the U.S. is tap water that's been purified, according to data from the Beverage Marketing Association, a trade group. If you're concerned about the water quality in your area but don't want to pay for bottled water, check out our review of water filters. Water obtained from a well that taps a confined aquifer, an underground layer of rock or sand that contains water. Example: Fiji Natural Artesian Water. Water that has been boiled and then recondensed from the steam that the boiling produces. Distillation kills microbes and removes minerals, giving water a flat taste. Example: Glacéau Smartwater. Groundwater that naturally contains at least 250 parts per million of dissolved solids. All minerals and other trace elements must be present in the water when it emerges at the source. Example: Calistoga. Public water source, also known as municipal water supply, or tap water. Fun fact: Aquafina, one of the top 10 selling domestic brands, used to say “P.W.S.” on its label—but changed that in 2007 under pressure from Corporate Accountability International to make clear that the water came from a public supply and not some pristine mountain spring called P.W.S. Water from any source that has been treated to remove chemicals and pathogens according to standards set by the U.S. Pharmacopoeia. Must contain no more than 10 parts per million of dissolved solids. Distillation, deionization, and reverse osmosis are all purification methods. Examples: Aquafina, Dasani. Water that contains carbon dioxide at an amount equal to what it contained when it emerged from its source. Carbon dioxide lost during the treatment process may be added back. (Carbonated waters such as soda water and seltzer are considered soft drinks, not bottled waters.) Example: Perrier. Water derived from an underground formation from which water flows naturally to the Earth’s surface. Spring water must be collected at the spring or through a borehole tapping the underground formation (aquifer) feeding the spring. 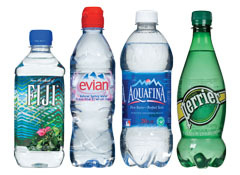 Examples: Arrowhead Mountain Spring Water (Nestlé), Evian. Water accounts for 60 percent of our body (or about 11 gallons or 92 pounds inside a 155-pound person) and is essential to every cell. So it’s not to surprising that new research—reported on at the recent British Psychological Society Annual Conference in London—found that college students who brought water with them into an exam scored higher marks than their counterparts who didn’t have water. Unfortunately, the researchers didn’t look into whether the students actually drank the water. Nor did they investigate the reasons behind the study findings. But the researchers hypothesized that drinking water could improve students’ thinking and/or help students stay calm and quell their anxiety—both of which could hinder their test performance. Their thinking makes sense to me: other research has suggested that staying hydrated keeps your memory sharp, your mood stable and your motivation intact. You can also think through a problem more easily. (CNN) -- New York City officials are proposing banning the sale of large-size sodas and other sugary beverages at restaurants and food carts. "More than half of NYC adults (58%) are overweight or obese," Mayor Michael Bloomberg tweeted Thursday. "We're doing something about it." The ban would outlaw such drinks larger than 16 ounces at restaurants, food carts and any other establishments that receive letter grades for food service. It would not apply to grocery stores. Critics -- including McDonald's and Coca-Cola, which stand to be hurt by the proposal -- quickly assailed it as "misguided" and "arbitrary." The New York City Department of Health will submit the measure to the Board of Health on June 12. There will then be a three-month comment period before the board votes on the proposal, officials said. "If approved, the city's proposal would take effect six months after Board of Health approval and would be enforced by the city's regular restaurant inspection team," a statement from Bloomberg's office said. "Restaurant owners will have nine months from the adoption of the proposal until they face fines."